From her birthplace in Sudan, to her adopted home in Memphis, Ruth Lomo has taken the initiative to use her gifts and skills to improve the lives of the women and children around her. Ruth was born in Sudan in 1970. Coming from a family that understood the value of education, she attended high school and then had the unusual opportunity to participate in vocational training. She considered the three options, looked around, recognized a need and enrolled in the carpentry program, where she was the only woman. In 1993, during Ruth’s 23rd year, violence erupted between the Sudanese government and rebel forces. Fearing for their lives, Ruth took her own five children, her sister’s six children and one other child and walked for five days to the border with Zaire. From there they crossed into Uganda where they reached the relative safety of a refugee camp. In 1995, her homeland still unsafe, Ruth searched for other options for herself and the children. Discovering better opportunities and services, they journeyed to another camp in Kenya. The intent of refugee camps is to provide housing on a short-term basis, but due to the on-going violence in Sudan, Ruth’s family stayed six years, until 2001 when their situation was evaluated by the United Nations. Clearly it was not safe to return to their home, so Ruth and the children came to the United States under the auspices of the Associated Catholic Charities Refugee Resettlement program. Arriving in Memphis, she and the children were provided with a social worker and a place to live. She found work as a carpenter and quickly learned to use the power tools now available to her. Shorty after getting settled, she managed to enroll all the children in her care into parochial schools. Having had little opportunity for education in the camps and speaking little English, they were nonetheless placed in grades more equivalent with their age than their level of learning. Recognizing this, Ruth found them tutors through a program at Second Presbyterian Church. Seeing the difference this made in the lives of her own children, she started arranging tutoring for other refugee children. Fluent in several languages, Ruth also helped other women from Sudan, Afghanistan and Somalia learn the skills they needed in their new home – how to drive, enroll in English language classes, navigate a new culture, help their children succeed in school. Ruth’s experiences had given her a clear vision of what women needed – an organization to support and teach refugees how to advocate for themselves and their children. She created the International Community of Refugee Women and Children out of her own dogged determination that it needed to exist, and with support from organizations such as Catholic Charities, the United Methodist Neighborhood Centers and her own church community. Eventually Ruth left the carpentry business to create her own home-cleaning business. She still devotes much of her time to the ICRWC, continuing to oversee the organization’s after-school tutoring program for children. Each morning Ruth takes her children to school, does home cleaning in the day and industrial cleaning at night. Four afternoons a week, she goes to the tutoring center to babysit so that mothers can attend English classes. She gets home at midnight or later and then gets up the next day and does it all again. 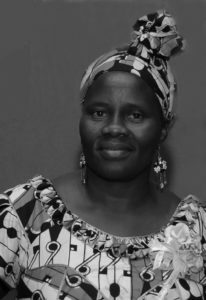 She continues to network with other refugee coalitions in other areas, learning and sharing with other women what she has learned. The refugee women in Ruth’s program wanted to tell us about Ruth. Using their growing English skills, they spoke with shining eyes and they had a lot to say. They described her as a mother, a sister. Ruth Lomo is building new lives for her family and for many others. She is in every way a Woman of Achievement for Initiative.